This image taken from the Twitter account of the former National Football League player Colin Kaepernick shows a Nike advertisement featuring him that was posted Monday, Sept. 3, 2018. Some sliced the swooshes right out of their socks. Others lit their shoes aflame and filmed while they burned in their yards. All had strong feelings about Nike’s new “Just Do It” campaign and one of its newest faces: Colin Kaepernick. Nike revealed Monday that Kaepernick — the out-of-work NFL quarterback who generated controversy for kneeling during the national anthem to protest racial injustice and police brutality — would be featured in its 30th anniversary “Just Do It” campaign. Country star John Rich showed off a pair of Nike logos that had been removed from his sound man’s socks. A video of a pair of shoes that had been set on fire went viral. “Just Don’t,” posted one Instagram user. “Just Blew It,” posted another. President Donald Trump has been persistently critical of NFL players protesting during the national anthem, a movement Kaepernick launched. Trump and others have frequently mischaracterized Kaepernick’s protests as being against the anthem or the American flag. Trump weighed in on the Nike campaign Tuesday, telling the Daily Caller that he thought Nike was sending “a terrible message” using Kaepernick in the ads. Still, he acknowledged the company’s right to take a stance. “As much as I disagree with the Colin Kaepernick endorsement, in another way … it is what this country is all about, that you have certain freedoms to do things that other people think you shouldn’t do, but I personally am on a different side of it,” Trump told the Daily Caller. Meanwhile, the hashtag #NikeBoycott was trending on Twitter. In trading Tuesday, Nike shares closed down more than 3 percent. ESPN reporter Darren Rovell, who broke the news Monday, reported Nike’s new “Just Do It” campaign would target 15- to 17-year-old teenagers and also include professional athletes Odell Beckham Jr., Shaquem Griffin, Lacey Baker, Serena Williams and LeBron James. Rovell tweeted Tuesday that the NFL did not respond to a request for comment on Nike’s decision. In March, Nike and the NFL announced they had extended their longtime partnership for game apparel until 2028. As The Washington Post’s Mark Maske reported, Kaepernick last fall filed a grievance against the NFL, alleging multiple teams colluded to keep him out of the league because of his protests during the national anthem. The irony of people discarding or defacing their Nike merchandise to protest something they disagreed with was not lost on those who supported Kaepernick and his protests. Many poked fun at the boycott, even filming satirical videos of themselves “destroying” their own Nike gear in ludicrous ways. Others vowed to wear their Nike apparel more frequently or to buy Nike gear to make up for the boycott attempt. Companies are often pushed to respond to negative publicity or public pressure. 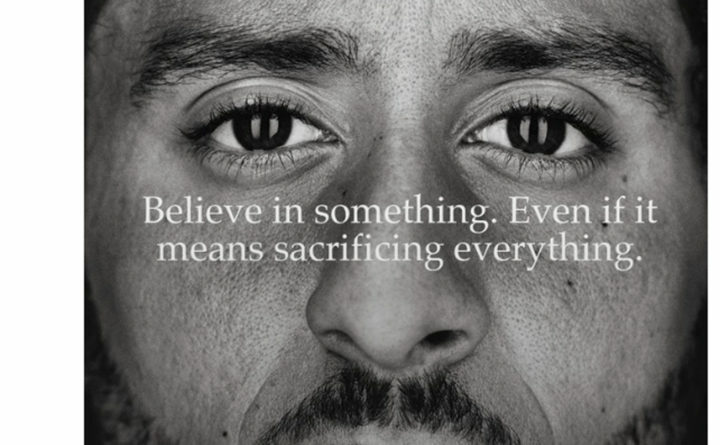 But in Nike’s case, the Kaepernick ad sends a proactive message on social and racial justice, said Anthony Johndrow, a corporate reputation adviser. The default is to shy away from campaigning on racial issues because companies fear that their own internal ranks may not “stand up to the scrutiny that will come if we take a stance on this,” Johndrow said. Johndrow said there is a perception that “you’ve got to keep your house in order first” and that companies “can’t go proactive unless they’re pristine.” But Nike is charting another path, he said, not because the company lacks issues of its own but because it has historically engaged with hot-button issues in its advertising. Companies decide to take on issues based on how they define their mission, said Sonya Grier, a marketing professor at American University. With that comes the risk of losing those with different views. But that’s an inevitable cost of taking on social justice causes, she said. It isn’t always as complicated for a company to take a stance on issues like climate control. But Nike’s ad “wades into different water,” Grier said. Joe Holt, an expert on business ethics at the University of Notre Dame, said there is an important moral difference to companies promoting their views “because you have to” versus “because you want to.” He said one true test of a company’s values is if that company is willing to stick to them even at a financial cost. Nike’s use of Kaepernick in the “Just Do It” ad seems to affirm that dedication, Holt said, because it will inevitably alienate some customers. The Kaepernick ad is not only about racial justice, Holt said, but also tackles civil engagement. He pointed to a meeting between Kaepernick and Nate Boyer, a former Green Beret and football player, after Boyer wrote an open letter critical of Kaepernick’s seated protest. Kaepernick invited him to talk.